Persimmons, yellow leaves, windy rains and pumpkin pies. Yes, I'm going to talk about Fall today. The season is technically not over, I know. But, let's not lie, doesn't it seem like fall is only one month and half long – say, October to mid-November - and suddenly BAM it's Christmas season? My fall has been all about working, recovering from cold, working again, and switching between melancholic korean indies groups, Queen and 70s' disco songs. Then of course, I moved onto christmas shopping and all the excitement that goes along, and realizing that fall was over, I thought Well, what made fall this good this year? So I came up with a few things that I wanted to share with you through this post – my Fall Favorites. I divided them into 4 basic categories (Fashion / Beauty / Food / Lifestyle), allowing me to focus onto one item for each. Yea, otherwise I would talk about a hundred of things and during hours... So let's get started! Turtlenecks have become one of my must-have tops since last winter: it goes well with all kind of bottoms and gives a very chic, adult touch to your look. I must admit that before last year, I would always keep them fold in my closet and never wear them – I guess it reminded me too much of my mum's young times. Then last fall, it was the trend in Seoul so I got a thin pastel pink one (that happened to be a bit too tight, uh) and bought a bigger, warmer one online. Ok, it's more that I fell in love with its rich, soft purple color. 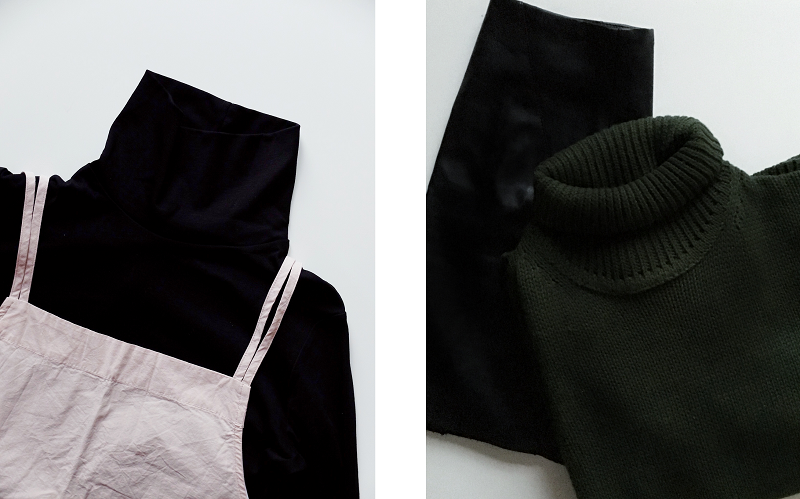 Turtlenecks are definitely a great piece to own in fall and winter, you can match it with a simple pair of jeans on off days, a chic cotton pants for work, a skirt or even a dress. Plus, it is a basic, genderless, ageless cloth that always looks sophisticated. So if you decide to buy a black turtleneck, don't worry too much as you might still be wearing it in five, six, seven, or ten years! This body soap is a bomb. 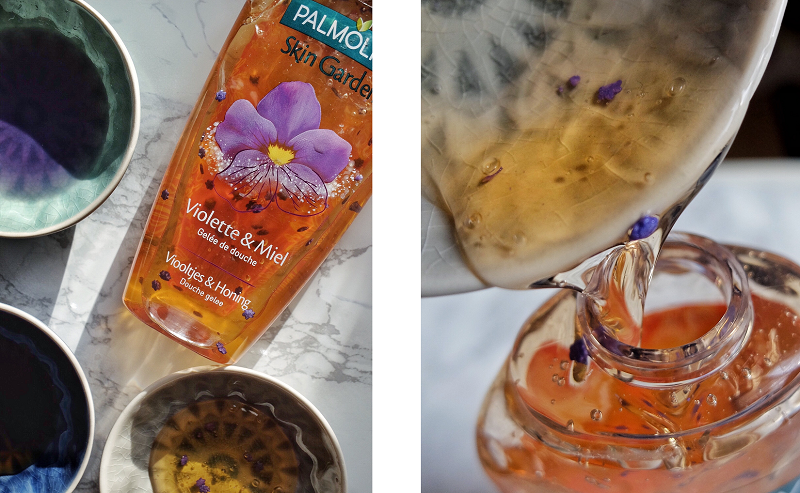 I never thought I would one day talk about bath products on my blog but, let me tell you about this one. It was a lovely Friday night, crashing at my friend's after teatime at a Japanese tofu place (where we had violet syruped soy milk - also a bomb by the way) when I discovered it. Because of the jelly texture, I first thought I mistook and it wasn't a shower gel, that it was some kind of pudding lotion or something. Then I got out of the shower, head to the kitchen and told her ''Girl, I love the smell of your body soap''. I'm usually not a big fan of honey scented product, especially for cream, but the floral touch of the violet makes it lighter, and the combination works amazingly well. It seriously smells heaven. 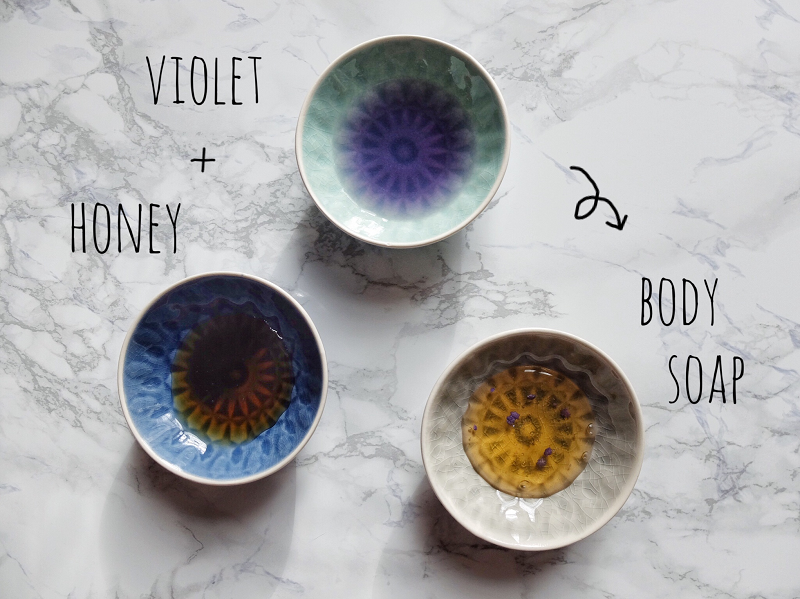 Plus there are cute violet flower shaped salts inside, which is a cute reminder rather than just adding some purple coloring. Bath time is really important to relax and (literally) have some time for yourself, so why not having a favorite body soap to make it even better? Ok, I'm cheating. Pancakes are not fall favorites and I know, it should be all year round yummy maple syruppy dessert. 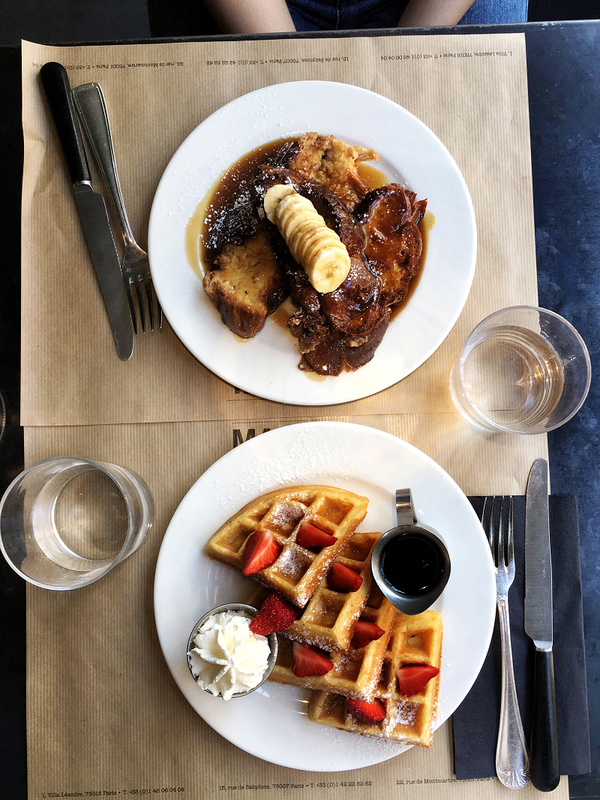 But, this being said, as I haven't talked about that cool brunch place called Marcel, I thought it was a great occasion to. They have three shops in Paris, in the 1er, 7ème,18ème arrondissements, and the name comes from (from what I heard) their very first shop located in Etienne Marcel street, near Les Halles. They serve everything from breakfast to dinner, big goûters, coffee, juice and even wine. 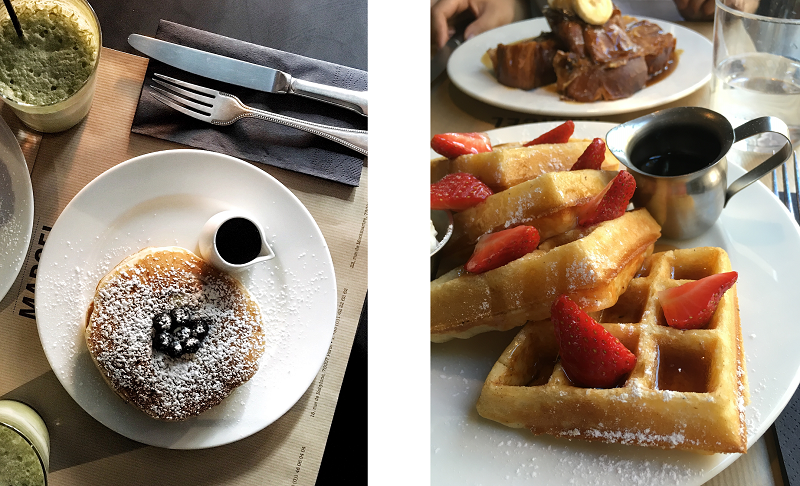 I went there twice ; first time, I ordered their famous french toasts - the floppy eggy texture was perfect, and second time, I went for strawberry waffles, super delicious too. I would just advise you not to take their matcha latte, definitely save money, it wasn't tasty. 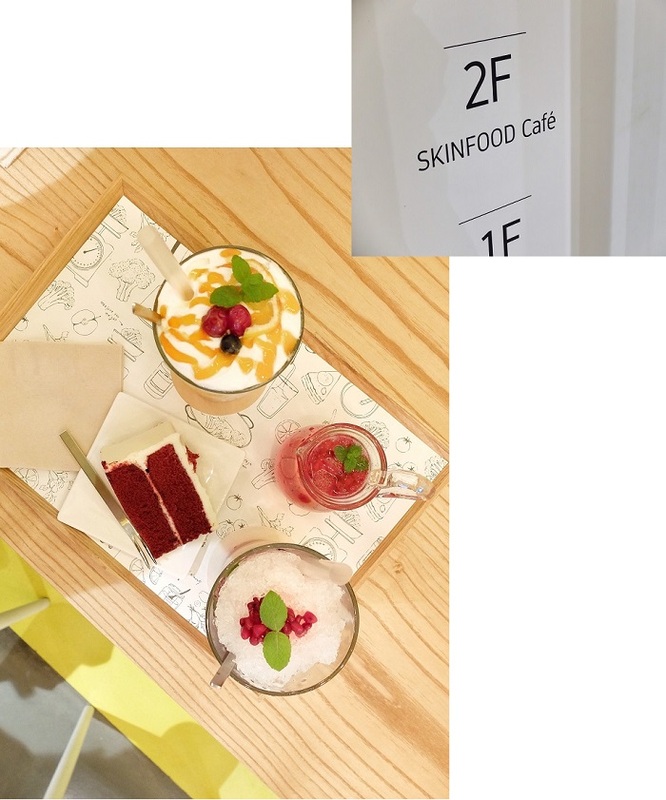 I haven't tried any savory dish but the menu is really appealing, especially the salads – the avocado, grapefruit, shrimp kale salad and the quinoa, pomegrenate, sweet potatoe, fig super food salad were VERY winking at me, but you have to be ready to pay 14~18€ for a plate. In overall, 13€ for two slices of eggy toast, 11€ for two pancakes and 12€ for one waffle cut into four pieces is quite pricey, I must say. But, this is a cool place to catch up with old friends or having a cool brunch with your lover on a day off and get your big dose of sugar, so let's not be guilty. Another incredible place that my sweetheart Carole (the same cool friend who had the violet body soap) told me about. 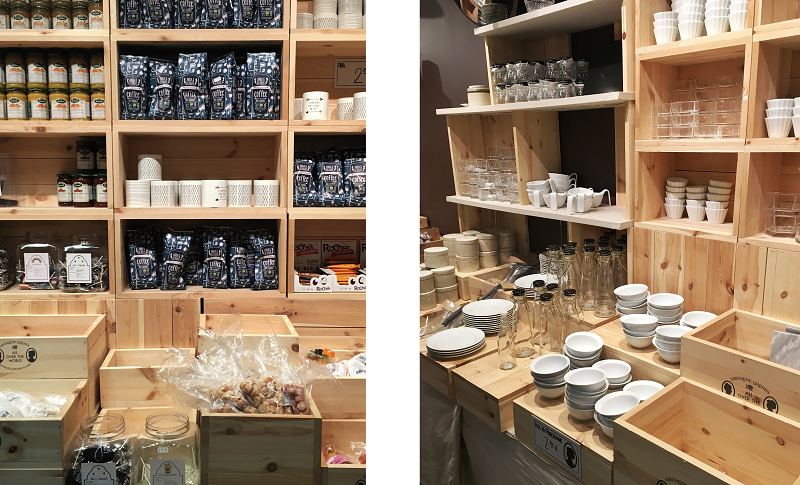 Søstrene Grene is a danish shop selling design items, furtinure, stationnery, kitchen ware and gifts – well, to put it in a nutshell, everything for your home in a Scandinavian style and at very cheap price. 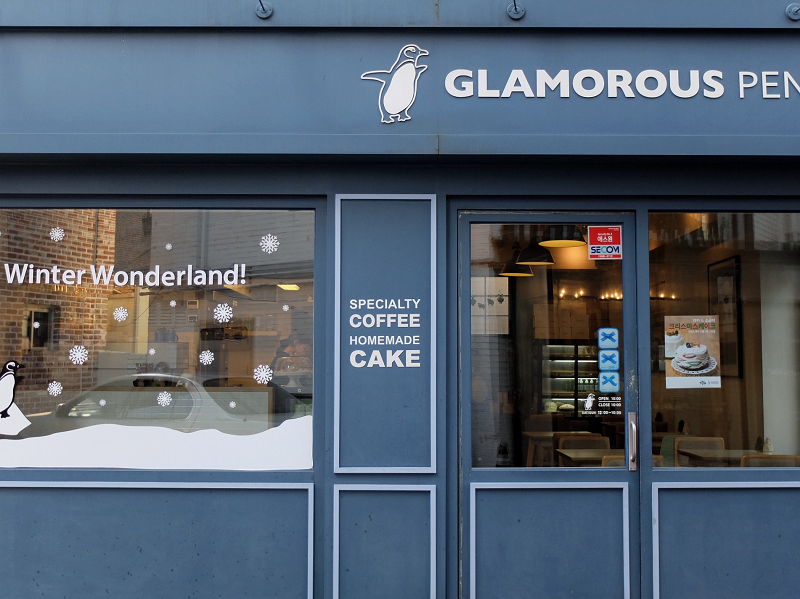 They are established in more than ten countries in Europe and also run a shop in Tokyo, Japan. As some may or may not know, I love Scandinavian design, especially tableware (and Moomin, but that's another love story of mine). So you can guess I was super exicted when I planned to get there for the first time. I went to the shop in La Défense, right outside of Les 4temps shopping mall, and it was very warm, neat, welcoming. 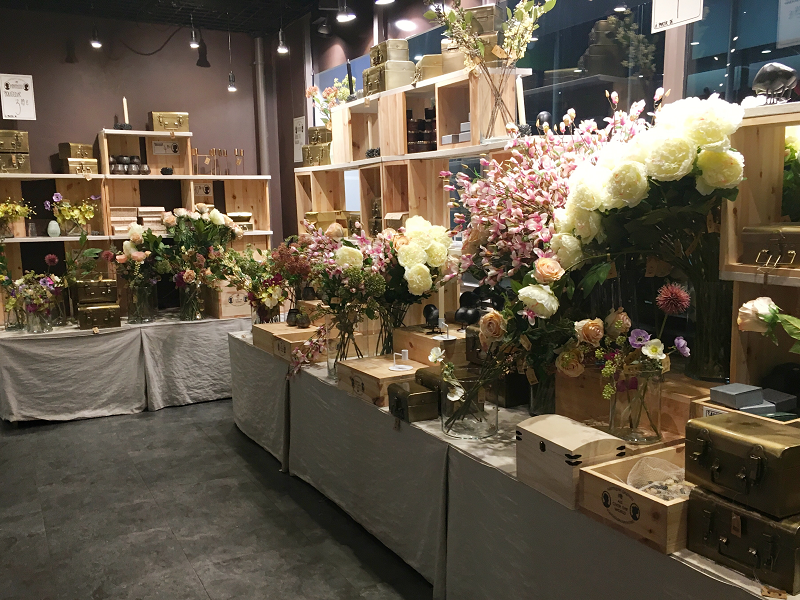 Everything was in sweet wood boxes and shelves, and it is displayed cleverly in a way you follow and see every items. 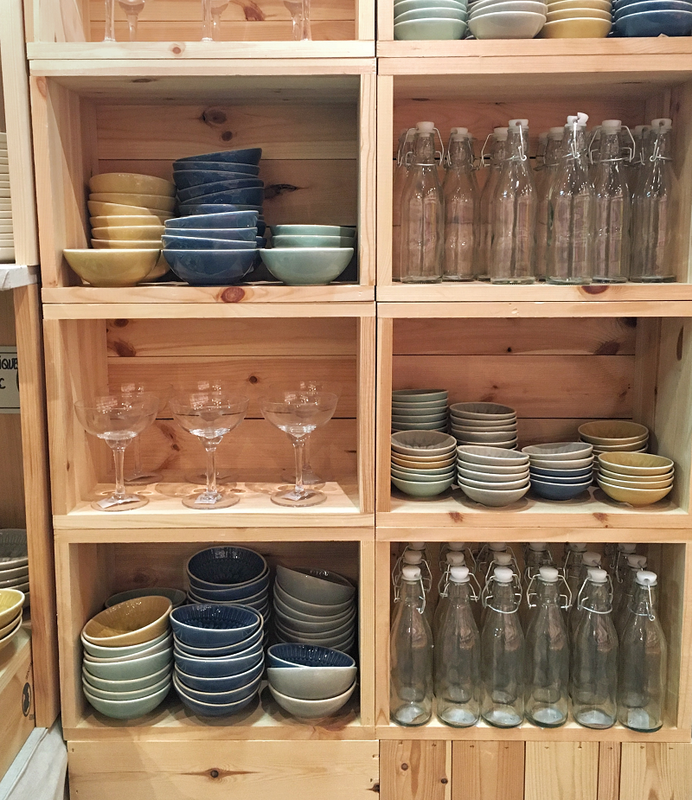 I expected to find more kitchen ware with really very scandinavian shape and design (but I still bought three adorable little bowls – the ones I put honey and syrup in the above pictures) but you can really find everything - children toys, wool balls, paint tools, office stationary... They even have a little corner with Danish tea and candies! You definitely get a lot of cool ideas for gifts. I won't hide I bought a lot of christmas presents there for my family and friends (all the lovely christmassy decorations always get me, them cute trees and santas), and as they seem to change their products quite very often, it is another good reason to go! 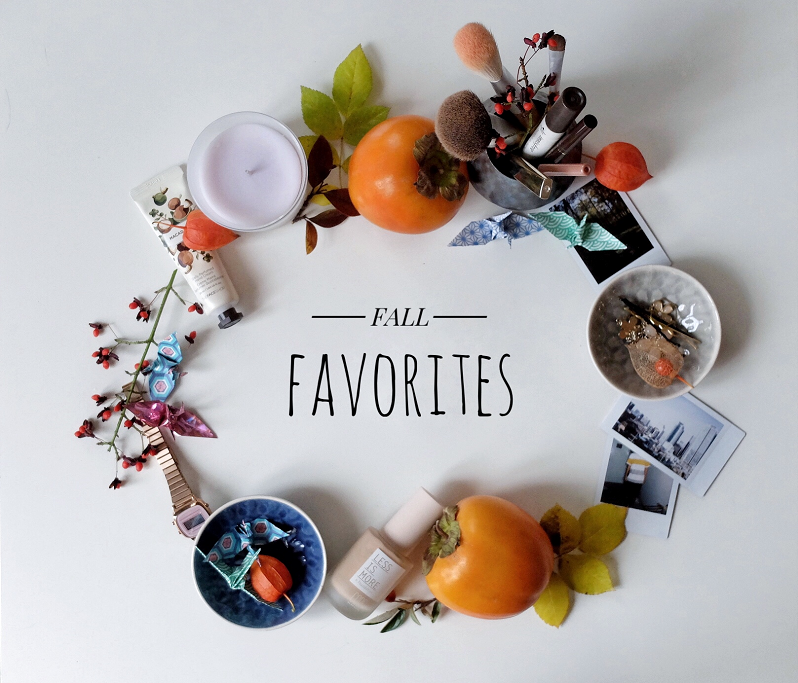 What were your favorites this fall? and don't forget to eat some yummy gingerbread!